Bhakti is a Lynx that is in the care of an approved sanctuary and she wasn’t doing well. At just five years old, she was experiencing lameness and ataxia, meaning she wasn’t in full control of her movements. 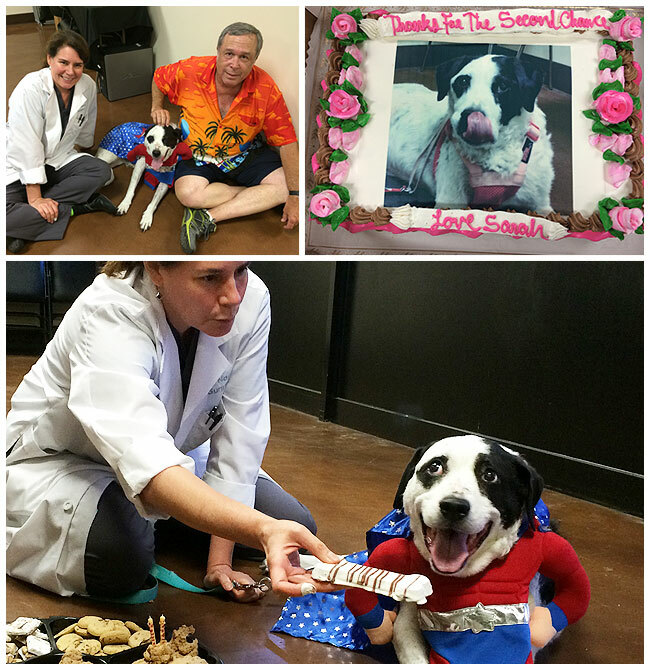 Bhakti wasn’t able to jump, run or play – until she met Dr. Jeremy O’Neill and Dr. Yonathan Buks! *Certain exotic animals, like Bhakti the Lynx, are not meant to be kept as pets. She’s in the care of a sanctuary and is not kept as a house pet. Speak with a veterinarian, zoologist, or exotic animal professional when looking for a proper avian or exotic pet. Dog Swallows Pantyhose for The Second Time. 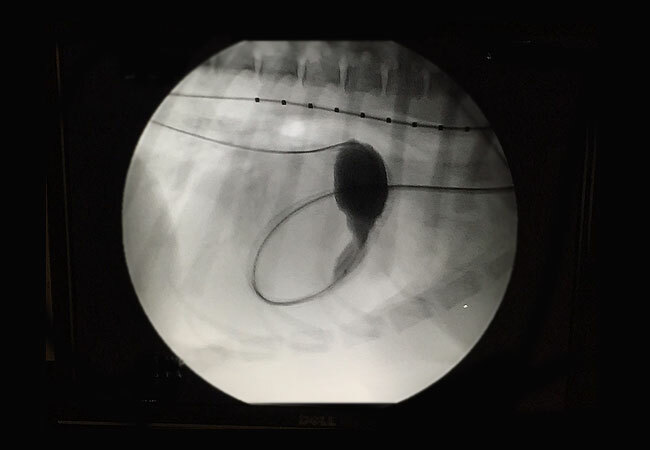 Sometimes when you’re a surgeon, you find weird things. Sometimes, you find them twice! Dr. Buks is seen here removing pantyhose from the belly of a Sheltie for the second time! How Gorilla Glue Can Kill Your Dog. We all know our pets shouldn’t eat things that aren’t pet food, but sometimes they can’t resist eating something they shouldn’t! It may seem obvious that Gorilla Glue is one of the top items to keep out of reach, but toxicity surprisingly isn’t the main concern with this common adhesive—it’s how it works. Once swallowed, Gorilla Glue begins to expand and harden in the stomach. 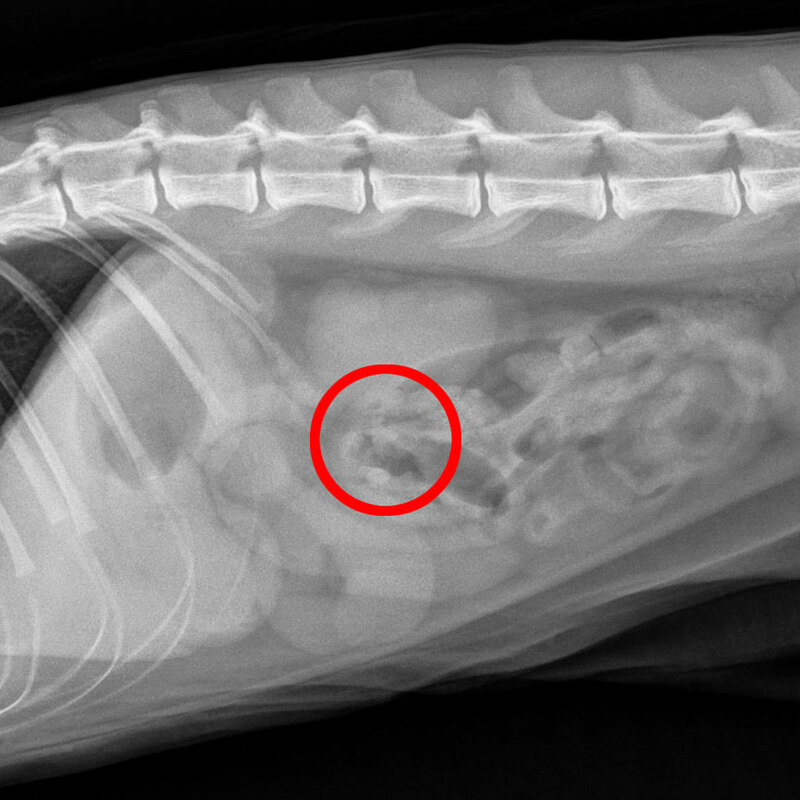 It becomes impossible for the pet (or even human) to pass or vomit it, causing a serious blockage. 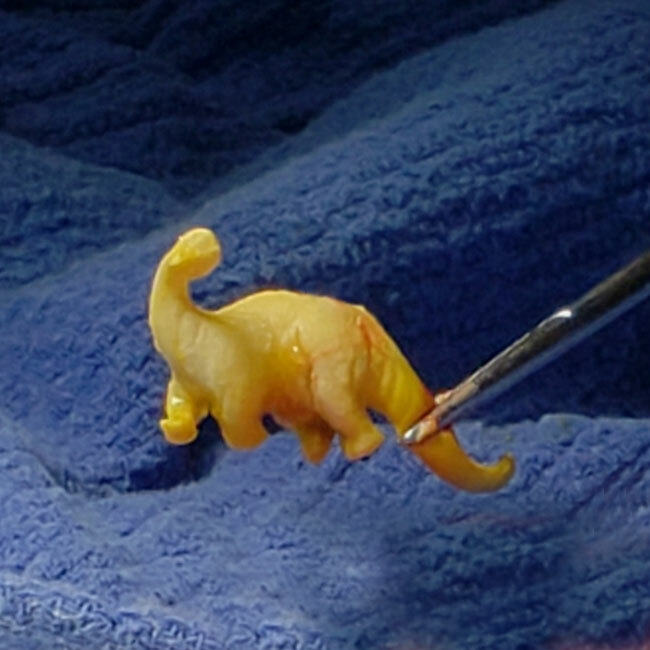 It can only be removed surgically and even then it needs to be addressed quickly. 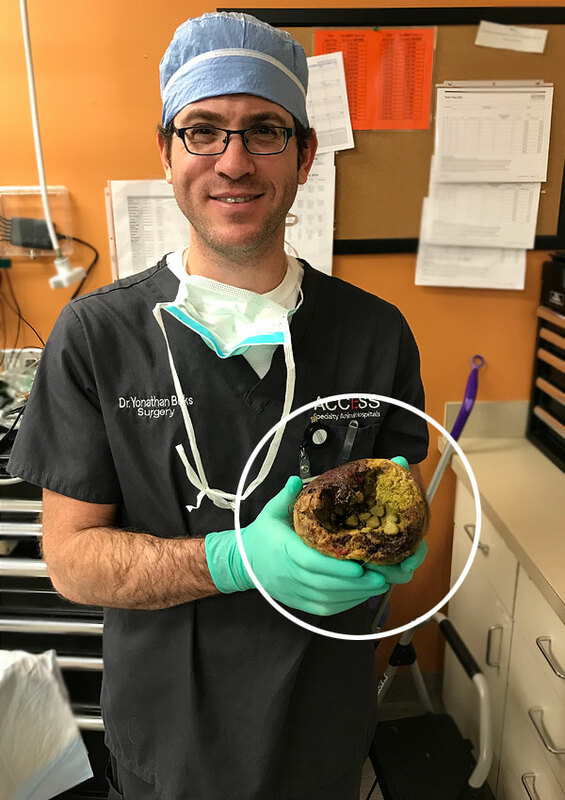 Here, we see board-certified surgeon, Dr. Yonathan Buks,with what looks like a geode. 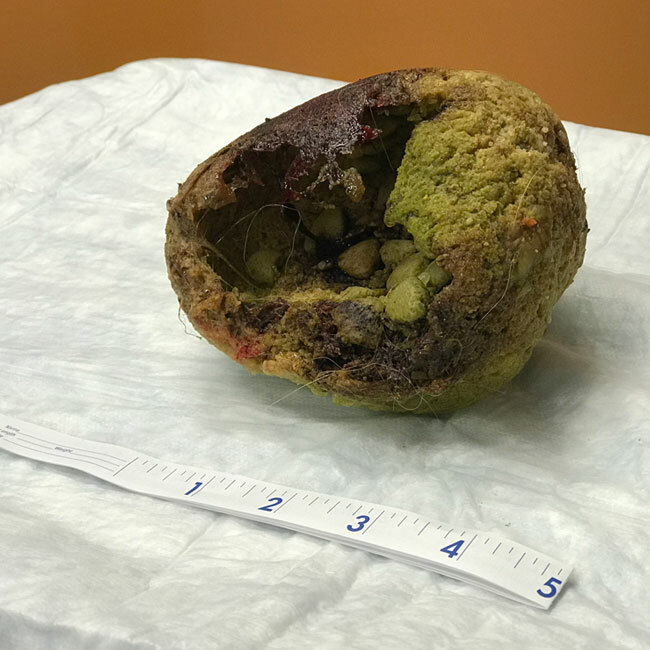 A closer look reveals it’s actually a lump of solidified Gorilla Glue surrounding some kibble that he removed from a puppy’s stomach. 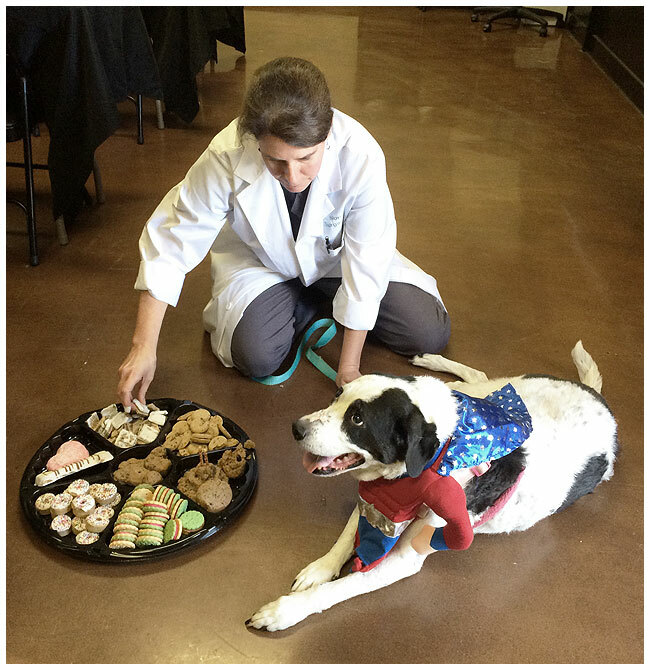 Be sure to keep non-food items away from your pet’s reach, and to call your veterinarian immediately if they come in contact with a dangerous substance. This week we welcomed Dr. James Kim, a board-certified surgeon, to our surgery team! 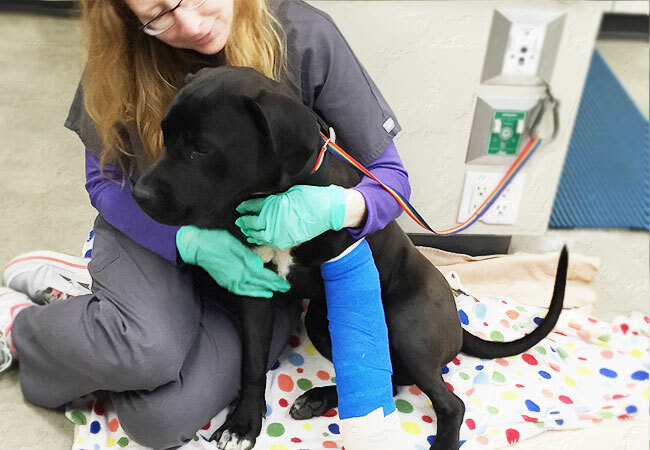 Here, he performs a fracture repair with Dr. Talli Hogen with assistance by several surgery team members. Rhianna is an RVT who works in the surgery department at ACCESS San Fernando Valley. She’s seen here snuggling a very sweet pup while anesthesia medication is administered. 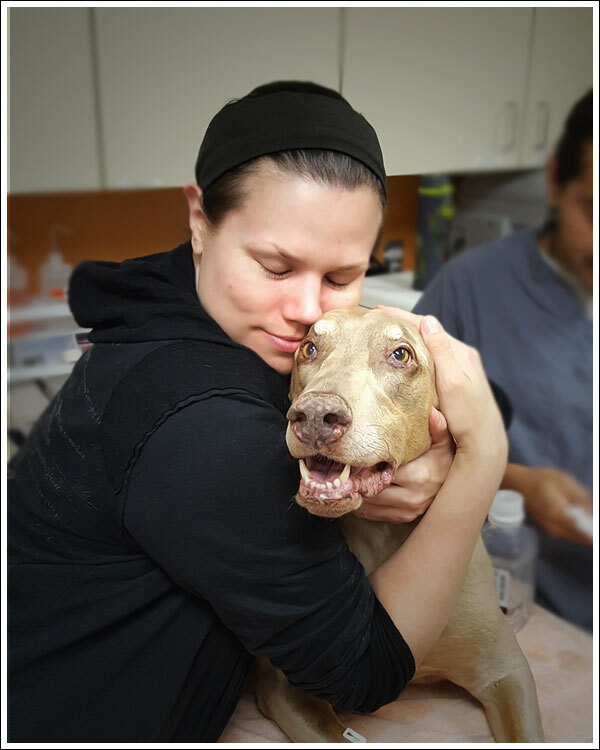 Our staff is highly trained in safe anesthesia protocol, and while it may not be in a textbook, snuggles and love are always included in our process. 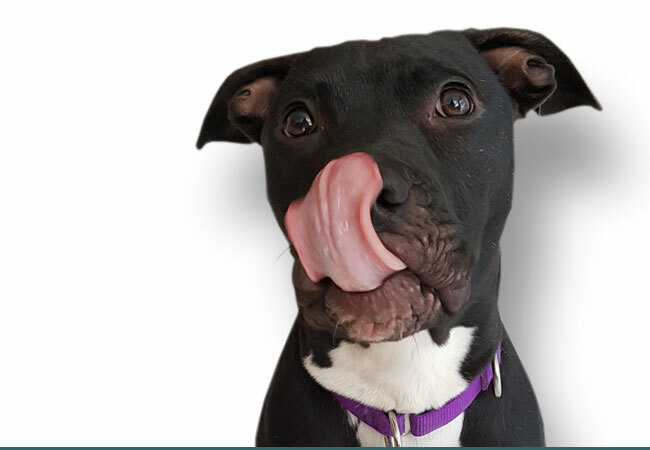 Max is a lovable Pit Bull mix who came into our Los Angeles emergency room after being hit by a car in early 2016. Luckily, Max was okay except for his front leg that was very badly injured. After the careful evaluations by our specialists and learning about all of their options, Max’s parents decided that the best course of action would be to amputate the leg. Even though Max’s injury was serious, he never lost his sweet and upbeat demeanor! 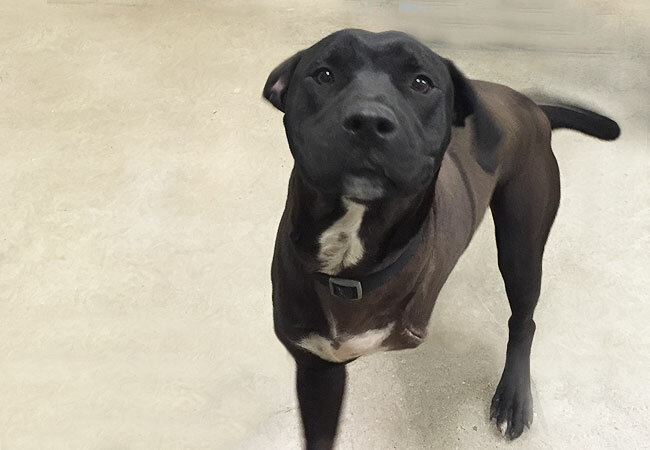 Max wagged his tail during his examinations and gave kisses whenever he could. 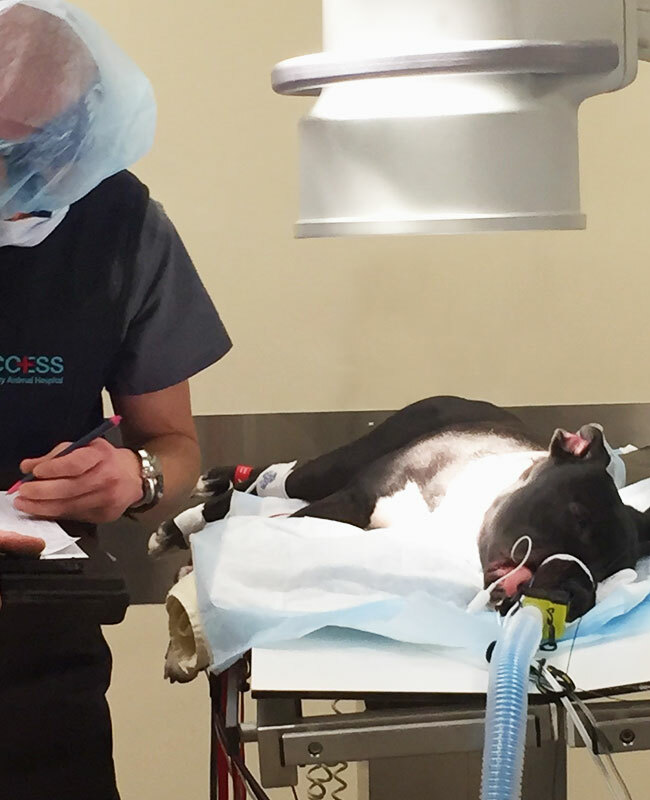 Before surgery, Max was snuggled by doctors and staff members and given medication to keep him comfortable. 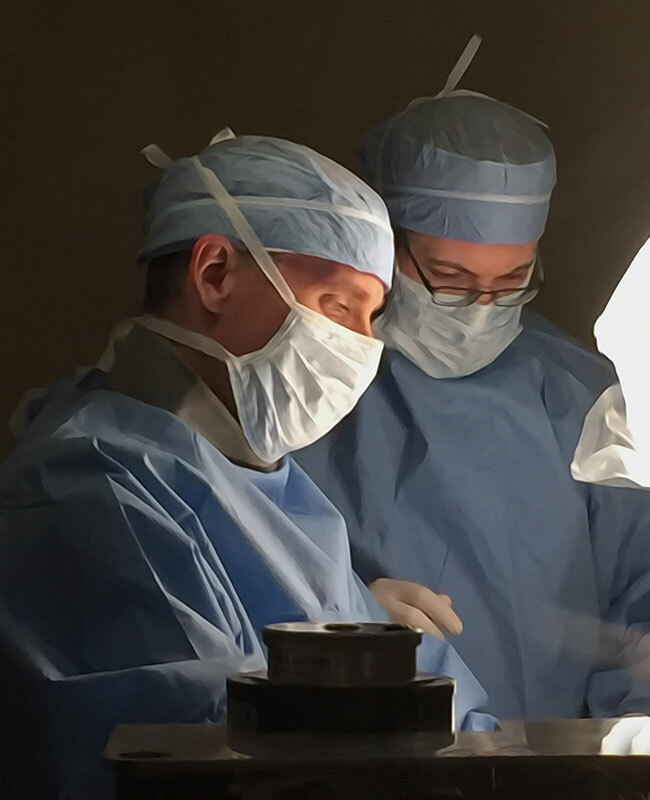 The surgery was performed by one of our board-certified surgeons, Dr. Kim Carey and was very successful. 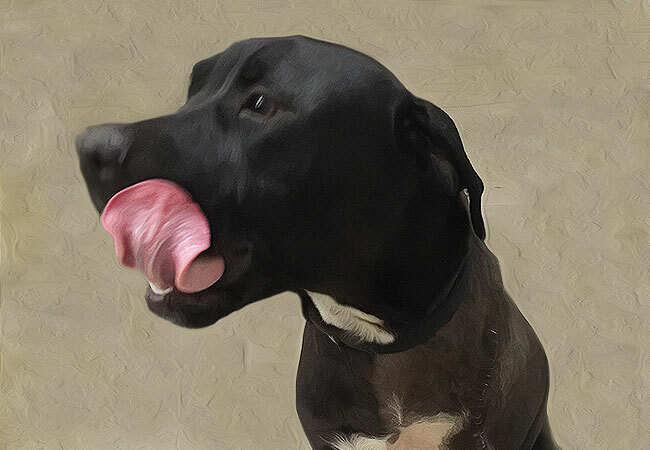 After his procedure, Max was kept in our emergency room for 24×7 monitoring where he was given medication, love, and when he was ready, food. Our staff and Max’s family worked together to make sure Max healed up appropriately and learned how to walk on three legs safely. 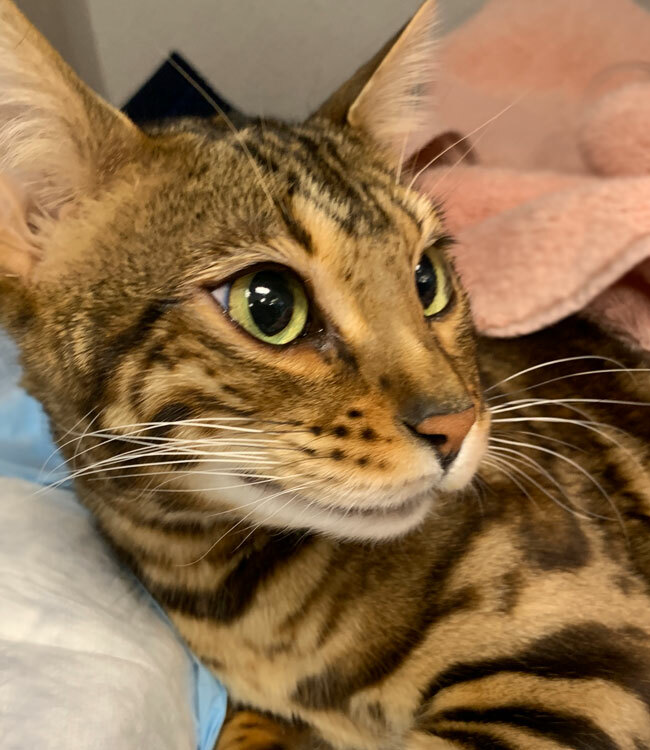 In no time Max was up and running and we were thrilled to see him doing so well when he came back to us for a recheck! 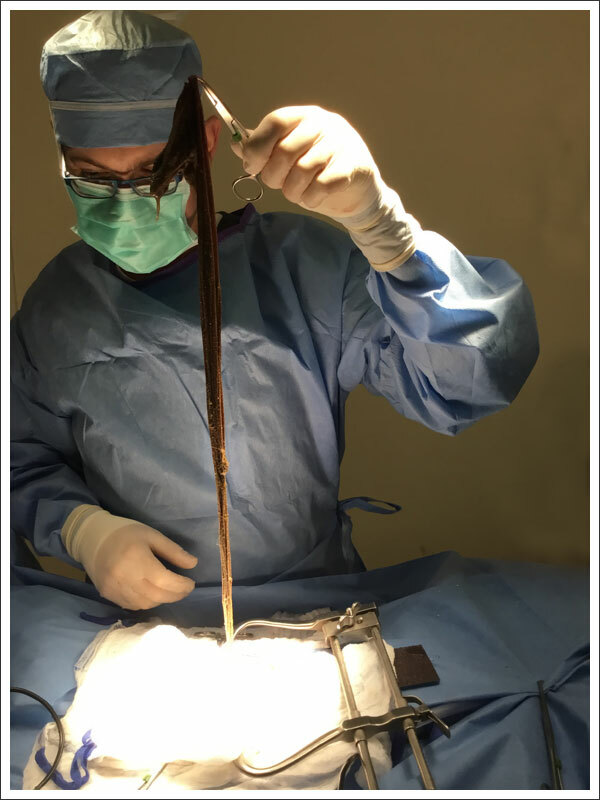 Now, after years of hard work and long, late hours, he has successfully completed an intensive written examination, along with a required publication accepted by peer-reviewed journals, and is a board-certified surgeon – in other words, a surgical specialist. 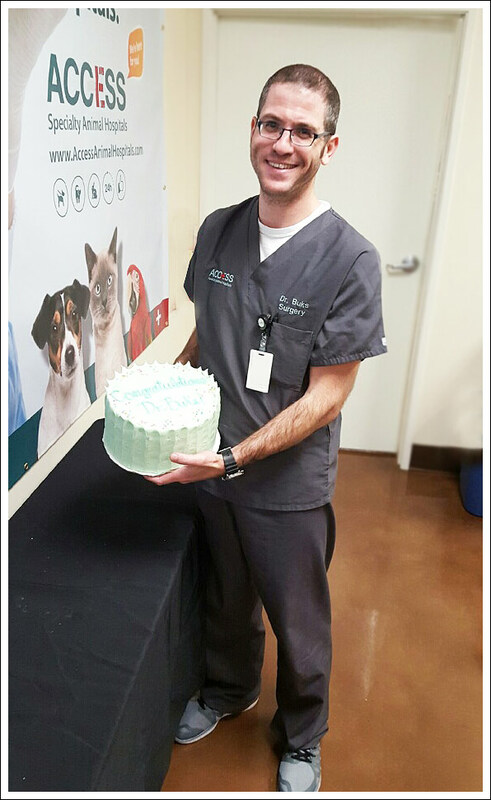 We are delighted to be able to celebrate his accomplishments – which also allows ACCESS Specialty Animal Hospitals to provide six day board-certified surgical coverage in the San Fernando Valley. Outside the operating room, Dr. Buks, who is fluent in English and Hebrew, enjoys downhill skiing, cycling, cooking, and spending time with his wife and two kids, as well as the household cat named Betty.